Welcome. Let me just say this is one of the BEST promotions CTMH has offered. 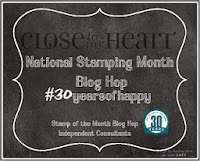 And all this awesome artwork in this blog hop proves it. My project is totally out of my comfort zone. It features really bright colors. As you can probably guess, it's part of a mini album, which is also a gift. So, I won't be sharing the rest of it for quite a few weeks. However, I will share a this tip. Base & Bling Adhesive is super strong. And is therefore, perfect for a variety of applications. As you can see this allows for the tag to be pulled out by the ribbons, with no fear of them pulling loose. I also use the base & bling adhesive when I am adhering small embellishments to embossed surfaces. Great job, can't wait to see the finished product. It's looking like it'll be a great mini-album! Adorable! Love the flower border.